We specialize in helping other PIs and attorneys assisting families, and families direct. Contact our agency any time – we’re there when you need us. We thank you for considering our agency for your Expert Consultations and Legal Investigations in Personal Injury, Negligence & Death in Civil, Criminal and Probate litigation, with an emphasis on cases involving Death and Serious Bodily Injury. Please contact us for your free initial case evaluation! < Click Here > to learn "What is a Certified Legal Investigator (CLI)?" 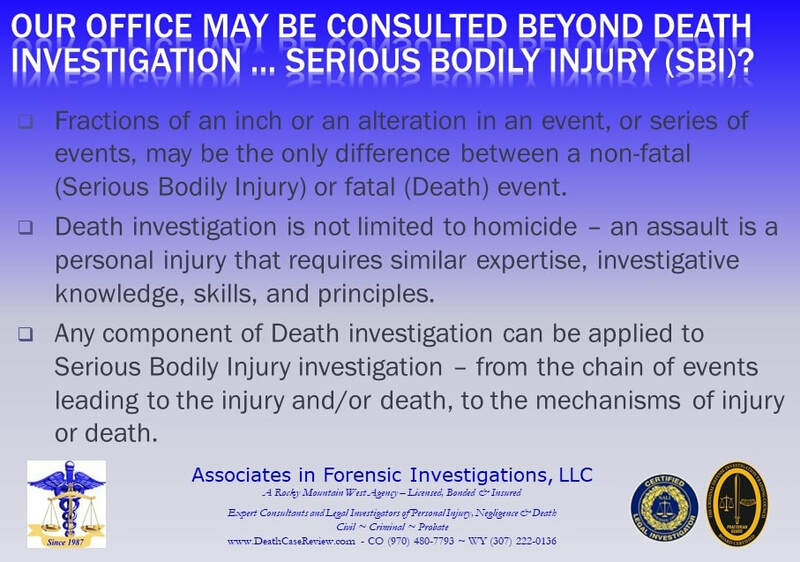 < Click Here > to learn "What is a Certified Criminal Defense Investigator (CCDI)?" < Click Here > to learn "What is a Certified Forensic Interviewer-Forensic Testimonial Evidence Recovery (CFI-FTER)?"